There is a good chance there are fresh vegetables in your refrigerator that will end up in the garbage instead of on your dinner plate. Not that anyone goes to the grocery store with the intention of later throwing the food in the trash, but we all do it more often than we probably realize. Ruth Litchfield, a professor of food science and human nutrition at Iowa State University, says we waste about 20 pounds of food each month. And that is per person. "It's a huge problem," Litchfield said. "When you think that 40 percent of the food produced in the U.S. goes to waste, that is just irresponsible." There are several reasons why so much of our food ends up in the trash and eventually a landfill, which all relate to our mentality about food. Litchfield says we need to move past the idea that more is better. Whether it's purchasing more than what we need at the grocery store or consuming large portions at a restaurant, our habits feed our tendency to waste. According to a 2012 Business for Social Responsibility study on food waste, 44 percent of food going into the landfill comes from the home, followed by 33 percent from the food service industry. To do its part, the food service industry is employing a variety of initiatives, said Susan Arendt, a professor of hospitality management at Iowa State. Donating food to shelters or soup kitchens, incorporating leftover foods into other menu items -- for example, using unserved green beans for vegetable soup the next day -- and collaborating with farmers to feed unused food to farm animals are just a few examples. "Some restaurants are also training servers to ask customers what they don't want with their meal. For example, instead of bringing both butter and oil with bread, they're asking the customer which one they prefer, rather than letting one go unused and have to be thrown out," Arendt said. Consumers can take similar steps at home to limit waste and ultimately save money, Litchfield said. Meal planning for the week. There are several benefits to making a weekly menu, not just cutting waste. If you know you're going to be at a ball game or other activities during the week, cut back on what you're buying at the store, Litchfield said. Make meals using frozen or canned vegetables and other non-perishable items that you can use the following week, if plans change. Find an alternate use for produce. Consider freezing or donating fresh produce that you're not going to eat before it starts to wilt or rot. Cut and package the fruits and veggies so that they're easy to pull out of the freezer and add to a smoothie or casserole. Composting. Some communities offer composting programs, but Litchfield says it's relatively easy to do your own composting at home. Food converted to compost is waste diverted from the landfill, which contributes to greenhouse gas emissions. Understand sell by dates. Litchfield says we throw away 160 billion pounds of food that is fine to eat because of confusion over "sell by" or "best by" labels. The date that follows has nothing to do with the safety of the food, it's related to quality, she said. Infant formula is the only product in the U.S. required to have an expiration date. A provision in the proposed Food Recovery Act of 2015 would standardize the language to reduce confusion. When discussing food waste in class, Arendt breaks it into two categories for students. There is product waste, such as eggshells or coffee grounds, and service waste or food that is served and not eaten. She says product waste is often unavoidable, although some items are good for compost, while with service waste there are several opportunities to make an impact. For example, Arendt and a colleague conducted a milk waste study in elementary schools. By implementing simple changes, schools reduced the amount of milk waste. One school noticed students were throwing away unopened cartons of milk, and created a "share table" for students to leave unopened milk for other students to drink. She said another school limited technology in the lunchroom so students focused on eating, and not working or playing on their computers. Portion control is another step the foodservice industry is taking, but health-conscious consumers are more often the motivating factor. Still, this can help with waste. "Many restaurants are offering a half-portion size and a regular-portion size. Yes, customers want to receive 'value,' but it also depends on the type of customer," Arendt said. "Customers who are more health conscious are open to smaller portion sizes." In 2015, the U.S. Department of Agriculture set a national goal to reduce food loss and waste by 50 percent by 2030. Litchfield is doubtful that many consumers are aware of this goal or are making an effort to do their part. She says it is going to take policy, similar to seatbelt laws or tobacco taxes, to motivate people to make change. "If you look at when people really started using seatbelts, it was when there was potential for a fine," Litchfield said. "In some communities you are charged for garbage service based on pounds or number of cans. 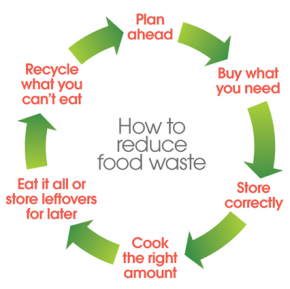 If you were charged based on the amount of food waste leaving the home, it might change habits." Another contributing factor is the cost of food. Litchfield is not advocating for higher prices at the grocery store, but she says food in the U.S. is cheap compared to other countries. If it were more expensive people would be less likely to overconsume, and be smarter about their purchases so food is not going to waste.